American wrought iron and brass rail nursery fire place fender with connecting brass swags and pleasing brass artistic scrolled wire work, New York, Early 19th century. 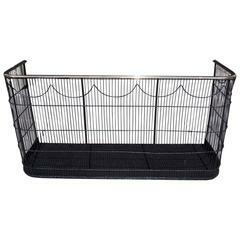 American wrought iron and brass rail nursery fender with connecting swags and pleasing artistic scrolled wire work . New York, Early 19th century. American diminutive complex artistic wire work and brass rail gallery fire place fender with centered wrought iron supports and base. Early 19th century. Petite brass and wire nursery fender, circa 1890. This early 19th century brass-mounted American nursery fender has an ember pan.